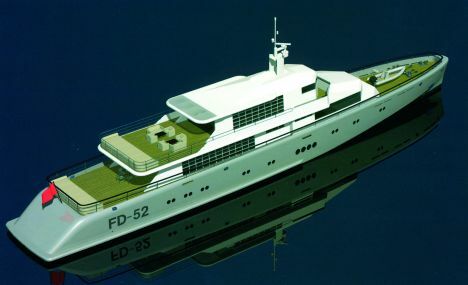 The Moscow based shipyard in collaboration with Martin Francis and his homonymous design team has developed a new version of the Timmerman 50 still sporting its angular shapes typical of certain military ships. The new model has a lower displacement, employs lighter materials and its accurate keel lines enable it to reach rather interesting standards of performance with low fuel consumption and, above all, with less powerful engines than the previous model. The use of more compact engines coupled to smaller fuel tanks has enabled the designers to make the interiors more spacious. The Timmerman 50 hosts 10 guests in 5 cabins, four of which are doubles with as many bathrooms situated in the lower deck while the master cabin is at the stern of the main deck. Areas in common include a saloon and dining area on the main deck. These are very bright thanks to large window panels placed on the sides and are matched to the cockpit area which has a dining table and numerous sunbathing mattresses. Sunbathing facilities together with armchairs and cocktail tables are also to be found in an area dedicated to relaxing on the exterior extension of the upper deck. In the extension's interior there are two separate compartments, one is a social lounge with seats, coffee and card tables. The other compartment hosts a modern wheelhouse covering the full beam of the yacht and fitted with two small armchairs and a chart table. For further information: Timmerman Yachts Russia; 7 Rechinov str. ; Moscow 115407; Russia; tel. +7(495)7866622/1169884; fax +7(495) 7866633; Website: www.timmerman-yachts.com; email: sales@timmerman-yachts.com - Timmerman Yachts Mediterranean; "Le Castellara"; 9Avenue JF Kennedy; MC 98000 Monaco; tel. +377 93501212; fax +377 93501222; Web site: www.ycoyacht.com; email: jim@ycoyacht.com. declared cruising speed: 18 knots.- Range at 15 knots: 3,500 n.m. Classified: Det Norske Veritas (DNV), MCA.